Every Sunday we worship the Holy Trinity. We begin the liturgy in the name of the Father, the Son and the Holy Spirit. I announce the absolution in the name of the Father, the Son and the Holy Spirit. We sing to the three persons of the Trinity in the Gloria Patri, the Kirie Eleison, the Gloria in Excelsis and many hymns. However, today is the special Sunday dedicated to reflecting on the Holy Trinity. The Book of Concord, the declaration of the beliefs of our church, includes the three creeds, the Apostolic, the Nicene and the Athanasian. Each deals with the doctrine of the Trinity, but today is the Sunday when we confess our faith in the words of the Athanasian Creed, the longest and most detailed of the creeds. Why three creeds that deal with the same theme? Why is each one longer than the others? Our faith is in the Triune God. According to the command of the Lord in our text for today, we baptize in the name of the Father, the Son and the Holy Spirit. This doctrine is key to understanding baptism, in addition to the person and work of Jesus Christ. As the Athanasian Creed says: Everyone who wants to be saved, first of all, needs to have the true Christian faith. And if someone does not keep it whole and inviolate, her will undoubtedly perish everlastingly. The true Christian faith is this, that we worship only one God in the Trinity, and the Trinity in Unity. False teachers who want to destroy saving faith will always attack the doctrine of the Trinity, but often in an indirect way. 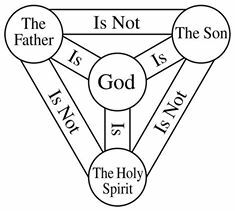 At the time of Athanasius, the Arians said that they believed in the Father, Son and Holy Spirit, but denied the Son's divinity. Today, the Jehovah's Witnesses deny the Son's divinity, so they are not Christians. So, in the history of the church we always reaffirm this doctrine in the clearest words. In the Old Testament there are allusions to both the Father and the Son and the Holy Spirit that have been presented as implicit mentions of the nature of God. In our reading for today (Isaiah 6: 1-8) the seraphim sang "Holy, holy, holy", three times as we sing today, although the prophet Isaiah did not understand the doctrine of the Trinity in its fullness. Also in the first book, Genesis, in the first verses, it says God created heaven and earth by His Word and His Spirit. St. John identified the Word that was in the beginning with God as God and says that the Word was made flesh in the person of Jesus Christ. The Hebrew word translated "God" is Elohim, which is plural in form although used as singular in reference to the one true God and as plural in reference to false gods. In Genesis 1:25, God himself says, "Let us make man in our image, according to our likeness ..."
In Psalm 2, the Lord says about His Anointed One (the Messiah, the promised Savior, "You are my son, I begot you today." Then says the psalmist, "Serve the Lord with fear and rejoice with trembling. Kiss the Son, lest He be angry, and you perish in the way,. " Even in Deuteronomy 6: 4, the classic statement of monotheism, we find the proper name of the Lord with Elohim: "Hear, O Israel, the Lord our God is one." Furthermore, ehad, the word translated as one implies diverse parts in unity, because the same word is found in Genesis 2:24, "Therefore a man shall leave his father and his mother, and shall be joined to his wife, and they shall be one flesh." Of course, in the New Testament, there are many verses that speak of the Father as God, Jesus his Son as God and the Holy Spirit as God. We find the full revelation of the three in the baptism of Jesus when the voice of the Father spoke of heaven, "This is my beloved Son" in reference to Jesus, and the Holy Spirit descended on Jesus in the form of a dove. And in our text for today we find this command of the Lord: "Go, therefore, and teach all nations, baptizing them in the name of the Father, and of the Son, and of the Holy Spirit." This Trinitarian formula appears only in this verse Like the other evangelists, Matthew inserts the revelation of the Trinity in his account of Jesus' baptism, but the enunciation completes the reservation for the end of the gospel. The baptismal formula, together with the baptismal proclamation, is a word both of explanation and of application. Martin Luther identified Matthew 28:19 and Mark 16:16 as the foundations of baptism as a mandate from God and therefore a work of God. Water united with the Word and the commandment of God serves the self-revelation of the triune God through the baptism of Jesus. preaching of the Father. "(Luther, Christ institutes baptism, January 6, 1534, pgas, 459-460). Therefore, to be baptized in the name of the Father, of the Son and the Holy Spirit is to be sure that what happened at the baptism of Jesus Christ occurred in our baptism. All three persons of the Trinity were present at the baptism of Jesus, and at our baptism as well. As all three were involved in the creation of heaven and earth, all were involved in the salvation of the world. The Father sent His Son to be born of the Virgin Mary; fulfill the Law in our places; suffer and die on the cross; resuscitate the third day; and raise the Father again in his divinity and his humanity. Then, the Father and the Son sent the Holy Spirit to the church for the work of sanctification. Our faith rests in the work of all the people of the Trinity. In this, we have the peace that surpasses all understanding. Amen.